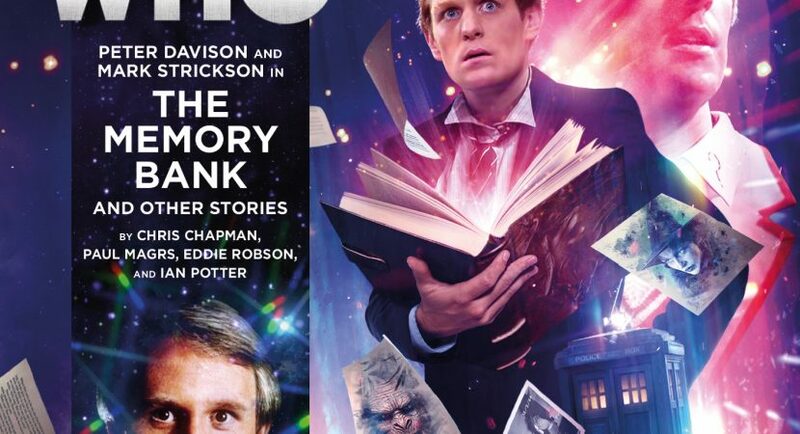 Like previous Main Range anthologies, The Memory Bank contains four half-hour stories, each riffing on a common theme. This time, it’s memory, a two-edged sword for the cultures that the Doctor and Turlough encounter. I and fellow fans have been looking forward to this pair of snarky gentlemen teaming up for their own Main Ranges, as hasn’t happened since Singularity. Even for Doctor Who, they’re an unusual Doctor/companion combination, not only because male companions are rare. Five’s fallibility and Turlough’s selfish pragmatism make them both unlikely heroes. They’re both sarcastic, privileged sons of advanced alien civilisations, a touch erudite and condescending (the Doctor despite his good intentions). And they’re both dilettante samaritans. In fact, the running gag is that Turlough’s just trying to get in some sketching (as we see him do in The Five Doctors), but the Doctor’s curiosity keeps landing them in horrible danger. Karma, perhaps, for the mischief Turlough used to rope his friends into back on Earth. Chris Chapman’s The Memory Bank is a strong opener, an SF concept piece about a society where memories are a matter of life and death. Turlough gets trapped in a dangerous job position he never asked for, while the Doctor has to run around patching leaks, uncovering this dysfunctional society’s dark secrets, and fighting monsters before too many people die. There’s subtle callbacks to past Turlough Big Finish audios, cleverly exploiting the Doctor’s absence to explore a little more of Turlough’s backstory. (Since the Doctor knows almost nothing about him in Planet of Fire, Big Finish always has a tricky time fleshing him out). Longtime EU author Paul Magrs dips his quill into a pantomime inkwell for The Last Fairy Tale, which feels like it was meant to be directed by Lisa Bowerman (Oh No It Isn’t!). It’s a comic piece playing around with folklore and storytelling tropes. I think the “Fabula” episode of 1001 Nights played this game a little better. But then, I’ve read so many excellent revisionist fairy tales that “Ha! We’re going to take fairy tale tropes and subvert them! *drumroll* earns a jaded “¥es. And…?” from me. However, I very much enjoyed hearing character actor Duncan Wibsey, who’s turned up in several audios before (notably as the music archivist and several other elderly eccentrics in Demons of Red Lodge). Eddie Robson’s Repeat Offender is a good old-fashioned murder mystery goldfish bowl. It’s one long scene which showcases the Fifth Doctor’s knack for digging himself in deeper and deeper with unconvincing gobbledygook, then fast-talking his way back out again. In other words, it relies on Peter Davison’s gift for the gab. It’s a clever piece, although it hinges on a messy paradox. I enjoyed the character drama enough to forgive the flimsy lampshade. And finally, The Becoming is an atmospheric adventure on a strange and hostile planet, giving the Doctor and Turlough the chance to stumble across a species with a very unusual life cycle. It’s a short but unfinished adventure featuring scary monsters, a truly alien setting, a likable female character, and the limitations of ancestral traditions. For some reason, this audio failed to engage me sufficiently, so that I kept having to start over after leaving it for a few days or a few weeks. Apart from The Memory Bank, each of the stories has a few minor problems which don’t torpedo them but don’t make them the best of what Big Finish can do. My difficulties had nothing to do with the short format, either, because other anthologies rank among my very favourite Big Finishes. Overall, I’d rate them 8/10, 6/10, 7/10, 7/10. Even if this isn’t my favourite anthology, I hope we hear more from the Gentlemen of Snark. Drag Mark back from his son and New Zealand to record more, please. I hesitate to nitpick, because… why diminish people’s enjoyment of perfectly good Doctor Who? But like I said, there were some little niggling things in three of the four stories that left me less than fully sated. Memory Bank hit all cylinders for me. Okay, big fatty blobby alien is a stereotype and the monsters are fairly generic, but it’s a half hour story. ( Turlough’s predicament, the juicy bits of character development and backstory for him, and the Doctor’s new friend round out a good half hour to make it seem like more than that. The Last Fairy Tale is one of the few times I’ve heard a Who story that felt shallow and unconvincing. Somehow, as Pythonesque as Castle of Fear was, I still believed the Doctor and Nyssa were really there and the story was happening. Whereas Fairy Tale’s “hostage situation” characters were just a little too gimmicky for me. I also winced at this “upgrade”: “Okay, the witch isn’t the evil woman, the princess is.” Because it’s gotta be one or the other, right? Whereas the dudes get to be shades of non-gender-stereotyped gray: dwarves or enchanted werewolves or storytellers, protagonists or humorously-subverted protagonists, etc, etc. Although I did like Turlough’s meta-analysis of the Doctor and his faith that the Doctor was up to something. We all know Paul Magrs can write better female characters than this. Here, have a selection of revisionist fairy tales that have crossed my social media feed in the last few weeks. The difference, I think, is that the characters are treated as real people, even when it’s a bit tongue-in-cheek: toad words, Susan Pevensie all grown up, The Fish Wife, Rejected Princesses. I loved Repeat Offender; in fact it’s my favourite on this anthology because I love it when Five uses words and wits in lieu of a kettle and a piece of string to talk himself out of scrapes. I also love the fact that it plays on our expectations — oh, Turlough’s being shifty and betraying him again, just as he did in Jupiter Conjunction; he must be up to something! Whereas if any other companion started acting that dodgy you’d immediately know they were possessed. I guessed the story would wind up with someone being possessed again before it was over, but Turlough still managed to trick me into thinking he was just being a cowardly git again. Sneaky. Only trouble is, that paradox with the whatsit Shroud killing all the past Doctors should have blown a bigger paradox-hole in the universe than Nyssa going back to her son in Prisoners of Fate. I feel like there should’ve been a way to tell this (not) murder mystery without resorting to that. The Becoming left me unsatisfied because it set up this fascinating, complex mess of a story, the Doctor realizes what’s going on and declares he’s going to help solve the mess, and then… whoops, time’s up! So instead of backing up his passionate speech, he tells the guest character, “Good luck with that!” and books it out of there. I appreciate that Fallible Five doesn’t always save the day; it’s one of his defining characteristics (see: Warriors of the Deep, Spare Parts, Creatures of Beauty, Burning Prince, The Elite, The Entropy Composition, Cold Fusion, Prisoners of Fate, Entropy Plague, and so many others). It makes him refreshingly flawed and approachable compared to his two predecessors. But it’s not enough to use Five’s inadequacy as a dramatic plot twist; it’s come up too often. So having him give up and go with his tail between his legs left this story feeling a bit unfinished to me. Which is even more of a problem, since The Last Fairy Tale also had a “whoops, the Doctor is useless; it’s up to a guest character to deal with the central problem” twist.